Planned Parenthood is found in multiple videos to be harvesting the organs and body parts of aborted babies in violation of federal law and this isn’t news? This is as evil as it is gruesome! 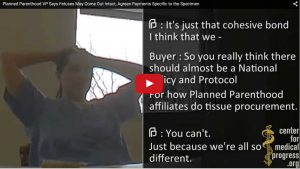 Planned Parenthood is running a criminal enterprise that is being subsidized to the tune of $500 million annually by the American taxpayers and the network media are missing in action. Now, we find out from Politico that Planned Parenthood’s newly-hired PR firm is encouraging the media blackout. And guess what? It worked! The network media didn’t touch the third video. They didn’t show the menu of prices for aborted baby organs and they didn’t show the dismembered baby in a laboratory dish whose fingers you could count. How is that for independent media! That the media are refusing to cover these videos is appalling. That the media are taking their orders on what is and is not newsworthy from Planned Parenthood’s PR firm is journalistic malpractice. The American people have a right to know what Planned Parenthood is doing with the half a billion they receive from taxpayers. The media have a duty to report on what appears to be Planned Parenthood violating federal law and committing the most horrible atrocities the likes of which have not been seen since Nazi Germany.